Exodus Smith receives THE CARPENTRY AWARD at My Father’s House Award Night. Exodus lives in Apt. 2 with Joshua Keamue, Moses Taweh and Saye Gea. He is in Grade 11 at the Calvary Baptist School. Whenever anything needs fixing we call on Exodus and his team of Carpenters. Ruben Gea and Paul Barchue are also skilled at carpentry. 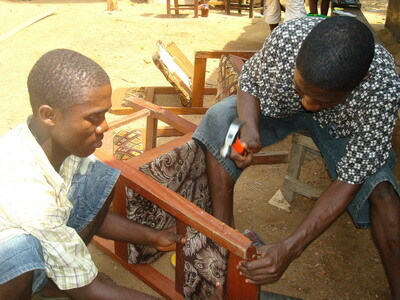 They have made benches, shelves, desks and other furniture items. We are very proud of their workmanship! 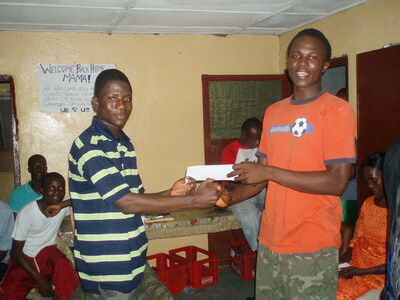 Exodus (on left) is happy to receive the award from Prince Borlay(on rt). Paul Barchue and Exodus Smith repair our broken chairs. 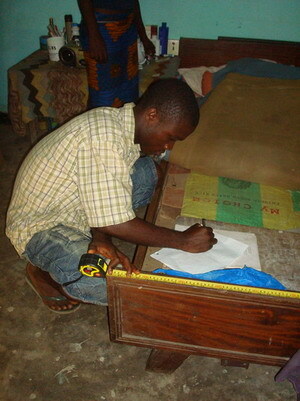 Paul takes the measurements to repair a bed for one of our widows. Paul and Ruben sit on the new benches they made. We always encourage our students to do work projects and use their skills and talents. We like to reward them for their accomplishments. Hi Exodus: Congradulations on the Award! Keep up the work in carpentry. It is a great skill to have. Even as a child I remember always pounding nails into things. My father taught me many things too. He was a carpenter and built many buildings. I was always helping. Now I can help others because of this practice. God bless you. Bob. Hey guys i am so inspired about your good work as a servant of God. I’m so grateful for to Mrs. Karen Barkman for the good she is doing through our lord Jesus Christ cause I’m a witness of that and may God continue to strengthen each and everyone of u brothers remember heart is with all ways through these hard times, you the reason of me coming back next year. keep up the good work and see u all soon.